A regional editor has called a court’s decision to dismiss a libel case against his newspaper a victory for free speech. The Jersey Evening Post and one of its advertisers had been accused of defamation by two politicians over a cartoon that appeared in the paper in 2008. Editor Chris Bright said it was an important decision for the future of freedom of expression in Jersey following the Royal Court’s dismissal of the case on Wednesday. After three days of evidence and legal argument, the court said that a light-hearted satirical cartoon published on Christmas Eve 2008 had not defamed island politicians Trevor and Shona Pitman. Chris gave evidence on Tuesday and argued that the cartoon was a comment on the general issue of Jersey States Members’ pay and it was right that the Pitmans had been singled out as they represented a new generation of paid politicians. 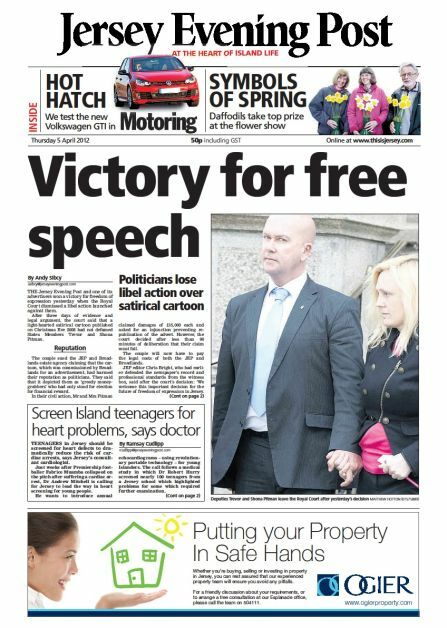 Said Chris: “We welcome this important decision for the future of freedom of expression in Jersey. “We have always maintained that the cartoon was not defamatory and took the stand we did because we believe that comment should be as free as possible, especially in the political arena. The couple sued the JEP and Broadlands estate agency claiming that the cartoon, which was commissioned by Broadlands for an advertisement, had harmed their reputation as politicians. They said that it depicted them as ‘greedy money grabbers’ who had only stood for election for financial reward. In their civil action, Mr and Mrs Pitman claimed damages of £15,000 each and asked for an injunction preventing republication of the advert. However, the court decided after less than 90 minutes of deliberation that their claim must fail. The couple will now have to pay the legal costs of both the JEP and Broadlands.